On his first trip to America, Christian Dior marvelled at the power of the original Neiman Marcus boutique, located downtown on the corner of Main Street in Dallas. A district now at the centre of an urban renaissance, Brian Bolke, co-founder and president of Forty Five Ten, is adding strength to the street’s retail heritage, with a new 37,000 sq ft flagship store. Bolke looked to Droese Raney Architecture to design the expansive four-storey store, which features an eye-catching dark brick facade and custom steel floor-to-ceiling windows. Forty Five Ten’s original 8,000 sq ft space on McKinney Avenue was renowned for its curation of established and emerging brands, from Rosie Assoulin to Dries Van Noten, and its new first floor features expanded fine jewellery and shoe salons and a rare beauty section. It also houses the chic Copper Bar, serving champagne, espressos and chocolates by Thomas Keller. Managed by the Joule Hotel, a fourth floor restaurant and lounge is also due to open later this month. Upstairs, the women’s and men’s floors are entirely furnished with Knoll furniture. Pieces by Charles Pollock and Frank Gehry populate the menswear floor, while on the women’s, custom rose gold chairs from Warren Platner’s 1966 collection complement bronze fixtures, and contrast against luxurious walnut, Brazilian granite and Arabescato marble. New departments also include china, crystal and silver and a tailoring shop. 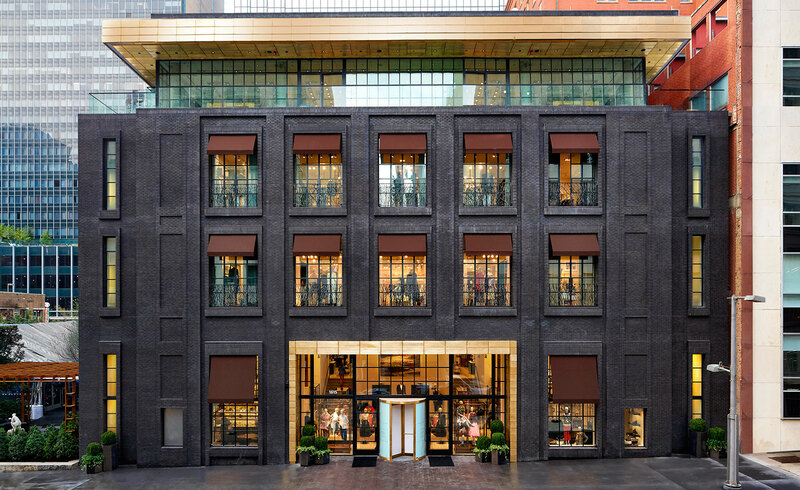 Appointing Nick Wooster as men’s fashion director and Taylor Tomasi Hill as women’s fashion director and vice-president of creative, Forty Five Ten has bolstered its retail offering with intimate Berluti, Maison Margiela and Azzedine Alaïa shop-in-shops. The dazzling new downtown location also houses a collection of rotating artwork by Tracey Emin, Catherine Opie and Juergen Teller. Lucea, a 25-foot kinetic wind sculpture by Anthony Howe sits at the store’s Elm Street entrance. Inspired by the power of the sun, it echoes Forty Five Ten’s orbit into the evolving cultural hub of downtown Dallas.